That would be ignoring the server/pack enforced restrictions and therefore open to exploitation. I do intend to update it for 1.13 but Forge needs to release a supported version for that first. I've been trying to invert the blacklist to make the mod only work on ores so I can keep it set to always active. Thank you Yuwee. I feel like this should be the default config that ships with this mod. Considering this pretty much restricts every single feature of the mod down to VANILLA ores making excavation on every other tool type impossible and shape mining pointless, no I won't be making this the default. The default doesn't restrict usage so players and pack devs can make use of all aspects of the OE in combination with every other mod they may be using before reconfiguring and enforcing pack specific restrictions as they deem necessary. Also consider the amount of users who are not savy with configs that would drop the mod assuming it didn't work with anything other than pickaxes and vanilla ores. Yes. For more complex tree logs you may have to manually group them in the JSON to treat them as the same structure but besides that, majority of mods and their blocks should be compatible out of the box without needing any additional compatibility add-ons. Nope. Despite the name the mod works with any tool/material setup. Picks on rock, axes on wood, shoves on dirt, shears on leaves, even swords on webs. Also with custom modded tools like tinkers or paxels. The axes won't cut the leaves down though. I'd recommend something like Fast Leaf Decay for that. For future reference, look under relations > dependencies to find what mod requirements a mod has. I've never seen a mod not have what they might need in there. The other "dependents" section shows other mods that require the one you're looking at. Having different control schemes per block/tool would be tedious for most users to manage themselves (because that's all client side and per-player) and wouldn't provide much benefit in the long run. Is it possible to make an option so that ore excavator considers block 'damage' values? So for example, if you have a patch of stonebrick and chiseled stonebrick, which both have ID 98, that it only takes one kind out and leaves the other? In vanilla it wouldn't be that much of a difference, but in many mods block ID's are shared with a lot of other blocks, and there it would make a huge difference! Thanks for considering! Yes. 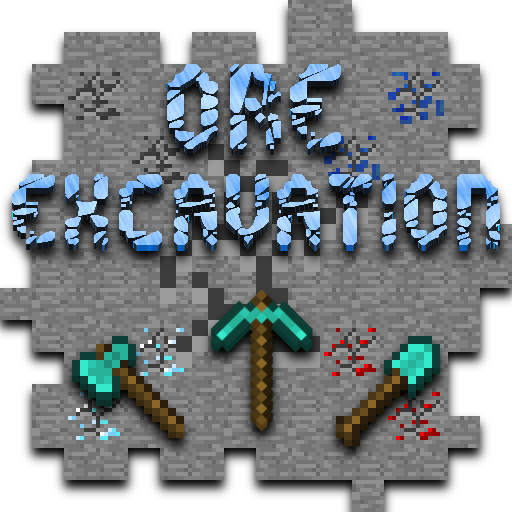 Ore Excavation already has configurable options for this. Normally blocks with similar metadata variants get grouped together, such as stair orientations, but there's a JSON config where you can set groups of blocks to have "strict subtypes" to disable that handling. This should make your chiselled blocks all treated separately. By default the only blocks that use this are crops so that you can harvest only the fully grown portions of your farm while leaving the rest untouched. There are probably plenty of other places and variants where you could make use of this functionality. I usually make rather large modpacks for myself to play with, and in that case there would be a LOT of id's to put in that JSON file. What I meant to ask was if it is possible to make a boolean setting in the config to make it ignore ore consider damage values by default. Or maybe a setting that makes the list you mention toggleable to be a whitelist or blacklist? If that is not possible I would understand ofcourse! I find it somewhat hard to believe that there would be an excessively large amount of blocks that would not be automatically handled correctly. OE tends to be pretty good at determining whether a block should or shouldn't try and combine its metadata without having to explicitly override it. If you really do want to just turn it off for everything you can just use * in the JSON. Well, as a simple example, I was building with different kinds of vanilla woods, not really thinking about the fact that they usually share the same block ID (17 in this case), and I wanted to clear the oak logs, and then the birch logs came down also. So even in plain vanilla it doesn't always make a difference between damage values. And yes it is all wood, but it is different enough that I would have expected it not to flow over. Thats why I had this idea for a toggle in the config that lets you decide if you want to keep it running like it currently is or let it make a distinction between damage values. But ofcourse, it is up to you as modmaker what you do and don't implement, it is merely an idea! Thank you for considering it anyway!